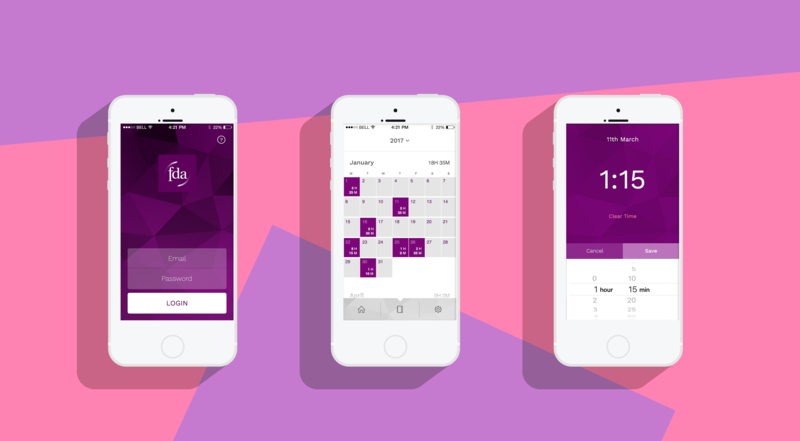 An app to help union members keep track of their overtime. As a union for senior public servants and professionals in the UK, the FDA is a voice for public services and the people who provide them. Ensuring employees are treated fairly is at the heart of the union’s principles and it was a privilege for the team at Papertank to help plan and develop a prototype for their trial. While the technological world around us might have progressed in leaps and bounds and helped up streamline our professions, this isn’t always the case with the institutions that run our civil services. Often the systems in place to ensure a fair and compensated workforce are antiquated, slow to process and often forgotten. This is where FDA stepped in to commission a new system that will help their representatives and members keep a better track of their working lives and use it to communicate for better conditions in the future. Working closely with the union and adhering to their priorities, we helped plan and develop an elegant solution to help their members keep an accurate account of their overtime and submit it to a central resource at the union. This would allow the unions representatives to track working patterns and highlight when working time regulations may have been met or exceeded. An accessible interface and clear, easy-to-use design elements help make this app straightforward and visually appealing for users of varying technological literacy. So far the app has received a very warm reception and plans are underway to develop this and other systems in the future.